Castle Comfort Stairlifts offers top brand stairlifts, keen prices and fast installs for all those seeking stairlifts in Exmouth and Devon. And all work comes with our no-quibble guarantees and famous customer service satisfaction. Continuing our West Country tour, today we head for Exmouth in Devon. Exmouth is home to the local office of Castle Comfort Stairlifts for all your stair and passenger lift needs. So whether it is your personal home mobility needs for a stairlift, new or refurbished, or a commercial business needing passenger or wheelchair lifts that need to meet DDA Compliancy, please give us a call on 01395 349198. But first let's learn a little more about the area. As well as Castle Comfort Stair lifts local 'home', it is also home to the Exmouth Lifeboat Station which is the base for rescue and searches for the Royal National Lifeboat Institution (RNLI) in Devon. There are a few other notable celebrities and companies with connections to Exmouth. For instance did you know that Radio 1 DJ Ed 'Stewpot' Stewart hails from here? Or that actress Pauline Collins perhaps best known for her role as Shirley Valentine on stage and screen and film role starring with Patrick Swayze in City of Joy was born here? Or that Pam St Clement – Pat on Eastenders –was brought up by a foster family in the area? Famously Sir Walter Raleigh sailed from Exmouth and Lady Nelson, Lord Nelson's estranged wife lived here. Exmouth is also known as a pirate base! Forerunners of Captain Jack Sparrow, back in the 15th Century William Kyd based his pirate operation out of Exmouth; John Nutt was born in Lympstone near Exmouth in the 17th Century and took to the seas as a pirate both off the Canadian coast and the west coast of England. What and where is Exmouth? Exmouth is a seaside town with 2 miles of golden sands and also a port situated on the banks of the River Exe some 10 miles south of Devon's County Town Exeter and thirty three miles from Plymouth (or 104 miles walking along the South West Coastal Path if you prefer). Both the sea and the river Exe give Exmouth its character and of course its 2 mile stretch of sand. Nearby Dawlish Warren on the opposite bank of the river and surrounding National Trust owned land at Orcombe also make it a popular tourist destination for its water sports, bird-watching opportunities and walking. This part of the southern coast is particularly beautiful and Exmouth sits at the Western end of the Jurassic Coast World Heritage Site which comes around the Devon coastline into Dorset finishing at Poole. Of course you're not quite Jurassic yet even if you have retired to this beautiful part of Devon! 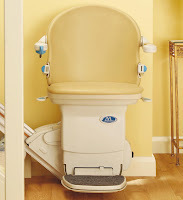 But if getting around has become a problem especially in your own home, then you need to contact Castle Comfort Stair lifts who have all the low-down on this form of mobility help. We can advise you on the type of stairlift best suited to you; we do part-exchange if you need to update your current stairlift and we can point you in the direction of funding for grants or 0% finance, whichever suits your circumstances and needs best. Of course you can't come to Devon without touring the beautiful countryside. As well as nearby craggy Dartmoor there are also a number of coastal venues and areas of natural beauty to visit. Dawlish Warren on the opposite bank of the River Exe is a small seaside town; it has a natural sand spit which is home to a Nature Reserve and the golf course. Dawlish just a few miles around the coast heading south was originally a fishing village and is now another seaside town which mainly consists of holiday accommodation. It is also the home of Black Swans brought from Western Australia and now living in a small bird sanctuary here. Both resorts have won the Blue Flag for best quality bathing waters. Going off in the opposite direction from Exmouth you'll find Budleigh Salterton which lies at the mouth of the River Otter. Like Exmouth it is on that South West Coastal Path and is part of the Jurassic Coast. Broadcasters Andrew Marr and Sue Lawley, actor Reg Varney and Muffin the Mule puppeteer Sally McNally all have connections to Budleigh. We're at the end of our short armchair tour of Exmouth and the surrounding district in Devon. With almost a quarter of the population of Devon of retirement age – the largest percentage in the country – we want to be sure you are aware of the help you can get from Castle Comfort Stairlifts. The chances are that if you've found this blog that you are interested to know more about who we are and how we can help you. Just watch the video at the top of the page from Castle Comfort Stairlifts founder about how we got started and then contact us for details of stairlifts whether it is a brand new one or whether you wish to upgrade your current stairlift for a more modern and stylish model, we can help. 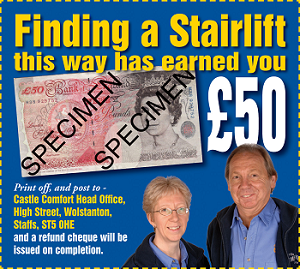 Get in touch with your local office on 01395 349198 and don't forget you can use the £50 off voucher towards your stairlift from us.